Dogs have individual personalities and react in different ways to stress and pain. Some dogs will let you know right away that they’re hurting while others will do everything in their power to mask discomfort. In general, however, dogs have a fairly high tolerance to pain. By the time you see clear signs of stress, your pet may have been uncomfortable for quite a while. Once you’ve seen signs of pain, it’s important to react quickly to relieve their suffering. Favoring one leg over another or walking gingerly is a definite sign that something’s hurting him. Hunching or arching her back. Some dogs naturally arch their back or hunch their shoulders to try to minimize pain. Sudden changes in the way a dog sits can mean that she isn’t comfortable sitting in her normal position. Pay attention to posture – it can be an early indication of pain. Excessive panting or shallow breathing can indicate pain, particularly in the torso and chest area. If your pet hasn’t exerted himself and isn’t overheated, panting may mean your dog is in pain. Shuddering, trembling or shivering in the absence of excessive cold indicate that your dog may be in severe pain. Squinting the eyes may mean your buddy has painful eyes. Check the pupils. Pinpoint pupils are a sign of eye pain. 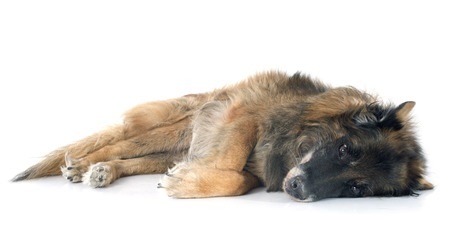 Vomiting, diarrhea or constipation can all indicate illness and discomfort in a dog. Over-Vocalizing. Many people overlook this pain indicator in dogs until they see other, more concrete signs of physical discomfort. Any time you can’t see a reason for your dog to be whimpering, whining or yelping, you should consider the possibility that he’s in pain. Growling or snarling for no apparent reason. Over-Grooming. Many dogs will chew on or lick their paws to try to soothe their pain. This is a part of their natural instinct to clean wounds and injuries, but the pain can be anywhere. Some dogs also paw at their face and eyes of they have facial pain. Shaking the head and rubbing the ears. These are frequently a sign that your dog’s ears are hurting from an infection or obstruction. Loss of appetite and thirst is common in sick or injured animals. Lack of sleep or too much sleep. Dogs who can’t seem to settle down for the night and who pace rather than lying down are often so uncomfortable they can’t find a good position for sleeping. Conversely, some dogs will sleep more than usual because their bodies are using a lot of energy for healing. Because each dog’s reaction to pain is unique, you need to be alert to specific personality changes. She may follow you around, begging for affection, or she may hide away somewhere because she’s too miserable to interact with you. Either way, if it’s not her normal demeanor, seek veterinary care. Aggression is another behavior that can be linked to pain. Never try to approach any dog who is growling or pinning back her ears. If your dog is in pain, it’s essential to talk to your veterinarian, who can help you determine the cause and a course of treatment. If your dog shows one of more signs of pain that last more than twenty-four hours, a visit to the veterinarian is in order. This is great information, thanks for sharing! My dogs usually retreat to a quiet area of the house away from us when they’re unwell. If they won’t accept a treat from me then I know they are extremely stressed about something. I’m sorry I didn’t see your post earlier; my dog refuses treats as well. In fact, he has never accepted or eaten a treat at the veterinarian’s office no matter how hungry he is. Thank you so much for this fabulously educational post. I don’t have a dog, but I do have cats and so many of these apply to them as well! Mr. N becomes extra clingy when he’s in pain. He always wants to be by me but he’ll start wanting to be on me. Bless his heart! My dog Soldier always wants to lay right next to me with his head cradled in my lap when he isn’t feeling well and I’m always happy to oblige. Some of these signs can also be found in cats too. I never owned a dog however I do recall that when my cats were sick or injured they would display the same traits. Favoring one paw over the other. Licking the injured area. Display lethargy and sleep a lot. Or at the worst dehydrated/no appetite. These are all great helpful tips to keep pet parents informed. Kamira, thanks so much for stopping in! You’re right about cats having similar behaviors when in pain. You might want to check out another blog post specifically about how cats exhibit pain, “16 Pain Symptoms in Cats You Shouldn’t Ignore.” Isn’t it amazing how both cats and dogs have that instinctual reaction to pain? We cared deeply for our cats and found ourselves with a cat hiding cardiomyopathy until it was too late. We do our best to keep our eyes open for signals like these. Thanks for sharing such a thorough overview and understanding of how to recognize pain in our dogs. As their advocates, we have to know the signs and be observant of changes in behavior. Your post is a great resource! Dogs reactions to pain can be, and usually are, extremely subtle. After all, it’s instinct to avoid looking weak. These are wonderful tips that your dog may be in pain. I think it’s important for people to realize the signs their pets may not be well. This is great information to bring to dog owners’ attention and I hope many print this out and keep as a reference. I confess, I have a file folder filled with these kinds of tips from others so that I can pull them out in an emergency. There can never be enough articles and information on this topic. So many signs of pain are often dismissed as signs of aging or signs of who knows what … it’s important people learn what such things really mean. Jana Rade, I agree completely. I once had a vet who told me, “Well, she’s old, so there’s not a lot to do for her. Arthritis pain is normal for a dog her age.” At the time, my black lab was about 14 years old. I was so upset I switched vets. The new vet was sympathetic and suggested a mild pain reliever/anti-inflammatory that worked wonders. There is no need for a dog to suffer just because she is old! This is really helpful. Our Lyla has pain from medical and physical issues but we still watch for changes in her behavior like added signs and symptoms. We of course help her with her pain as well. Some of these things, due to her joint, knee, and arthritis issues are normal for her, such as the way she walks. These tips are great things for us to be aware of and look for. Thank you! You’re welcome! I hope Lyla continues to bring you happiness in her golden years! Great information. Unfortunately, cats don’t usually show signs of pain until it’s almost too late. They’re great at hiding their discomfort. Good information. I especially could have used the information about the eyes. My Buffy had gone to the eye doctor with no problems and the next day was squinting. I called the eye vet and he was busy. I really should have taken her to my vet who would have squeezed me in. Three days later, I find out she is blind in that eye! I felt so stupid for not picking up on this sooner. It sounds like you did everything you could. When you take your pet to an expert and he says there isn’t a problem, your inclination is to believe them. In a case like yours, there probably wasn’t much you could do. I hope Buffy is doing okay. Fortunately, my dogs are generally pretty healthy, but it is good to know what they might do if they are feeling sick. Occasionally, my oldest dog limps due to some joint issues. Thank you for sharing this valuable information in one place. I saved this post to Pinterest so I can re-read from time-to-time. I’d much rather learn these signs than miss them or (even worse) rationalize them away. Great post! When our first mastiff, Maya, was diagnosed with osteosarcoma we saw just how stoic she was. Even though we knew she had to be suffering from tremendous pain, she never cried or whimpered. She would remain laying down, but wag her tail sweetly as if to say, “mom, it hurts to much to get up, but if you’ll come snuggle down here, that would be wonderful.” Mastiffs are notoriously stoic dogs and it is a challenge sometimes to tell if they are in pain. Sometimes, like you said, pain can surface as panting or an arch of the back…small things that you can miss if you aren’t paying attention. It’s amazing how our dogs keep trying to protect us from worry even when they are suffering. They are truly devoted to us, even when they are the ones who need our help. Great guide! I often have to remind my clients to check with a vet before they jump to the “aggressive” label! Dogs are stoic, but man can they have an attitude change if the pain is enough! That’s right, Shayla. The only time I’ve ever had an animal try to bite me was when my Labrador Retriever was having puppies. She nipped me during labor, and having been through labor myself, I didn’t blame her a bit! Thank you so much for sharing this information with other pet parents! Over-Grooming is a very common sign of pain that many people are unaware of. When I worked at the vet hospital, we often asked about Over-Grooming when we were suspicious of arthritis. Over-grooming is one that we weren’t aware of; thanks so much for alerting us to this potential problem. We certainly wouldn’t want to injure our pets when we think we’re spoiling them!